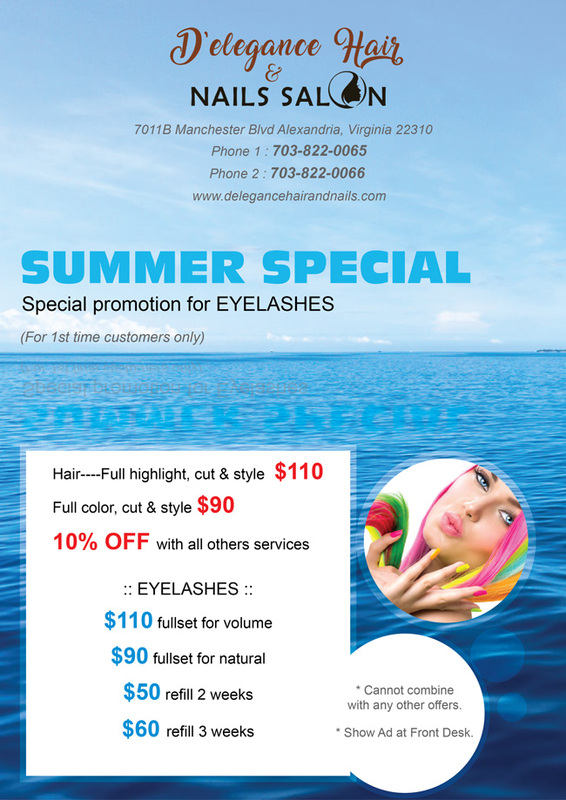 ﻿ Nail & Hair Salon 22310 | D’ELEGANCE HAIR & NAILS SALON of Alexandria, Virginia | Hair Cut, Styling, Hair Care, Manicure, Pedicure, Nail Care, skin care, Waxing. D’ELEGANCE HAIR & NAILS SALON brings you a New Brand of salon, a uniquely vibrant and relaxed environment with a modern luxurious feel back to our industry. We have an exclusive vision to recognize and re-establish what the industry has been lacking for many years now. Our priority is to make our clients feel pampered and relaxed while enjoying their experience here at our salon. We will maintain our progressiveness and edginess by creating the latest trends and offering excellent service throughout your stay with us. You belong here, you belong in luxury, you deserve pampering and excellence. "Quality Service. Attention to Detail. Relaxation at its best." Whether you are looking for a quick trim or a complete make-over, our aim is to sculpture your hair to fit your liking, your personal style and the way you live your life. Our Nail Technicians are trained in the latest nail techniques and services. Just sit back, relax and escape while we take care of your tired, aching feet and hands in our private Nail Service Room. We'll make you feel like royalty!